This biologist killed a rare bird in the name of science. The reaction wasn't pretty. "When I came upon the netted bird in the cool shadowy light of the forest I gasped aloud, 'Oh my god, the kingfisher.' One of the most poorly known birds in the world was there, in front of me, like a creature of myth come to life." "A little less than 2 weeks ago, I captured a poorly known bird, photographed it, and then euthanized and prepared the bird as a scientific specimen. This was neither an easy decision nor one made in the spur of the moment…Our recent fieldwork was not just about finding the Moustached Kingfisher. This was not a 'trophy hunt.'" His population estimate of over 4,000 remaining individuals is a robust number for a large island bird. With most of the bird's documented habitat intact, Filardi says "though sightings and information about the bird are rare in the ornithological community, the bird itself is not." With this in mind, the decision to collect a specimen—the first adult male to be taken—as part of the survey work is standard practice for field biologists, and could provide valuable information for future biologists or other scientists. The kingfisher, while not currently endangered, faces "real and enduring threats" from mining, logging and other development. Taking a specimen now ensures it will be available for future science. One oft-cited example of the importance of this type of research is the discovery that eggshells were thinner than older ones at a British museum in the 60s, which alerted scientists to the dangers of DDT. The collection and documentation of the bird, which Filardi had been tracking through some two decades of work on the Solomon Islands, can lead to collaboration between key stakeholders to advance conservation efforts in the region. Shortly after returning to the United States, Filardi told Scientific American that he had been "in the realm of the kingfisher," and that "there were multiple pairs or groups of these birds, up and down the ridgeline" that he'd traversed in the "sky forests" more than 4,200 feet above sea level. He said they were "unbelievably vocal." "Collecting is no longer standard scientific practice: it was a personal decision made by the ego of the scientist involved," wrote Simon Tucker. "Having met many 'experts' in my lifetime, I wouldn't trust most of them. 'Experts' are often some of the most egotistical, foolish, unGodly, out-of-touch, and least caring people on earth…Actions like this confirm common sense and decency have left the building and the scientific community," wrote nobleday. "I don't think this will de-popularise science. It will just make non-scientists think that perhaps, with modern technology and all, there are better, non-lethal ways to study animals. Science remains real popular in my house, but I just question the collection of that particular bird," wrote ahughes798. "Any species whose prospects of survival are adversely affected by the loss of one adult male is functionally extinct," wrote Andy Mitchell. A "no kill" petition has also been circulating, which requests the American Museum of Natural History to implement a policy prohibiting killing of species considered rare. Marc Bekoff, a professor emeritus of Ecology and Evolutionary Biology at the University of Colorado, penned a response in the Huffington Post in which he calls Filardi's actions "horrific," arguing that killing "in the name of conservation" or "in the name of education" or "in the name of whatever" must end. "It is wrong and sets a horrific precedent for future research and for children," he wrote. So was Filardi, the director of the Pacific Program at the American Museum of Natural History, transgressing acceptable scientific and possibly even ethical boundaries when he made the decision to kill a bird he had just seen and photographed for the first time ever? Dr. Bridget J. Stutchbury, a Biology professor at York University in Canada and author of the book Silence of the Songbirds, told Fusion that scientists like Filardi collect specimens "so that we have a permanent record of the species that are here now." "We are in the midst of the 'Sixth Extinction' and keeping the big picture in mind will help people understand why he apparently felt it was so urgent to sacrifice one bird for a greater purpose." Human activities are killing billions of birds per year and many these deaths are avoidable. Part of this big picture, according to Stutchbury, is remembering just how many birds are killed outside the realm of scientific preservation. She said about two to three billion birds are killed by cats every year in the United States alone and about 200 million are killed by flying into windows each year during migration. The latest estimates actually place between 365 million and 988 million birds as dying from crashing into windows in the United States each year. As for cats, a 2013 study found that in the contiguous United States, they kill up to 3.7 billion birds a year. "Human activities are killing billions of birds per year and many these deaths are avoidable; birds are facing the highest extinction rate in many thousands of years," Stutchbury said. She also said the biggest problem for songbird populations—even in North America—is the sprawl of human population and development that converts natural landscape into agriculture, oil and gas extraction, logging, and urbanization. In Stutchbury's eyes, this makes songbirds the modern day "canaries in the coal mine." "Their declines are triggered by the same environmental threats that humans face: deforestation, pesticides, climate change," she said. With all this in mind, the taking of one bird, such as in Filardi's case, is far from a simple issue of right and wrong, and depends largely on context. Stutchbury said that such a killing is justified if the local population will not suffer as a species from the loss of one individual. She also thinks there needs to be "a really good reason" why a whole bird is needed rather than simply DNA, feathers, photos and other valuable data. "I agree that having a specimen that can be studied by generations of scientists that come later is really important, especially for species that eventually go extinct," she said. Erin Bayne, an associate professor of biological sciences at the University of Alberta, told me he is "on the fence" about Filardi's actions. He said that since many adult birds only live a few years the consequence of taking one bird from a locally abundant population should not be large. Both Bayne and Stutchbury are featured in the recent documentary "The Messenger", which explores human connection to birds through the uncertain fate of songbirds as they suffer through a "mass depletion" on multiple continents. Bayne said that he has collected birds for scientific projects before when it was the only way of gathering the needed data. "It is not something anybody likes to do but is generally justified based on the contribution to science that the work makes in terms of what we learn," he said. According to him, the "merits" of such a killing need to be carefully assessed by peers and other professionals to ensure that the information is needed and the the appropriate sample size is collected. On this trip, the real discovery was not finding an individual Moustached Kingfisher, but discovering that the world this species inhabits is still thriving in a rich and timeless way. 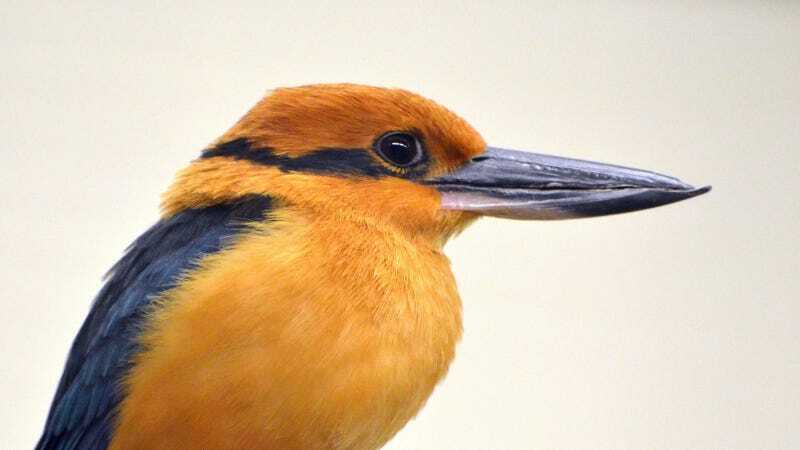 Officially called the "Actenoides excelsus," the Guadalcanal Moustached Kingfisher is a "beautiful but very cryptic forest kingfisher" according to the International Union for Conservation of Nature's (IUCN) Red List of Threatened Species. The IUCN estimates there to be 350-1,500 Guadalcanal Moustached Kingfishers alive, with the caveat that "this spectacular species is judged to be Endangered on the basis of a very small estimated population which is suspected to be declining, at least in part of its range. However, further research may reveal it to be more common." Filardi's research, which involved the taking of one of the remaining 350 (IUCN lower estimate) to more than 4,000 (Filardi's upper estimate), appears to have also revealed that the species may be more common than previously thought. As Filardi wrote in his explanation, "on this trip, the real discovery was not finding an individual Moustached Kingfisher, but discovering that the world this species inhabits is still thriving in a rich and timeless way." And in a world rampant with pollution, environmental degradation and overdevelopment, that sure sounds like good news. Let's hope it can outlast us all.